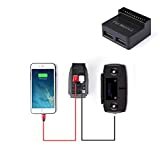 · This battery for the power bank adapter can convert your Mavic 2 battery can be used as a power bank, charge the Mavic 2 remote control and mobile device, such as cell phones, tablets, etc. · 2 port USB charging, Input: 9-20V / 0-3A, Output: USB 5V / 2A * 2, Specially designed for DJI Mavic 2 Pro / Zoom smart flight battery. · Discharge using the battery converter adapter, you can prolong battery life when you do not use the drone battery for a long time. · Notice: Package includes: 1 * Battery adapter to power bank, others are not included.